The lectin microarray is an emerging technology for glycomics. It has already found maximum use in diverse fields of glycobiology by providing simple procedures for differential glycan profiling in a rapid and high-throughput manner. Since its first appearance in the literature in 2005, many application methods have been developed essentially on the same platform, comprising a series of glycan-binding proteins immobilized on an appropriate substrate such as a glass slide. Because the lectin microarray strategy does not require prior liberation of glycans from the core protein in glycoprotein analysis, it should encourage researchers not familiar with glycotechnology to use glycan analysis in future work. This feasibility should provide a broader range of experimental scientists with good opportunities to investigate novel aspects of glycoscience. Applications of the technology include not only basic sciences but also the growing fields of bio-industry. 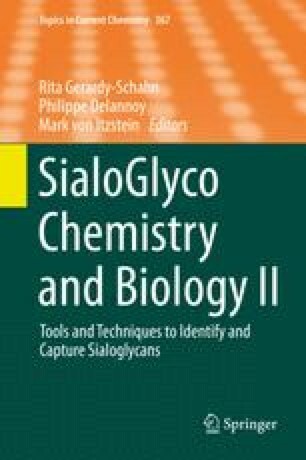 This chapter describes first the essence of glycan profiling and the basic fabrication of the lectin microarray for this purpose. In the latter part the focus is on diverse applications to both structural and functional glycomics, with emphasis on the wide applicability now available with this new technology. Finally, the importance of developing advanced lectin engineering is discussed.